Designed to protect your feet from the unique leg and foot stresses that snowboarding can cause, X-Socks Snowboarding Socks target the particular areas affected with impact-absorbing, yet low profile performance cushioning that protects without unnecessary bulk, and incorporate stability-enhancing crossover ankle bands and cooling ventilation channels for feet that stay comfortably warm, dry and defended all day. 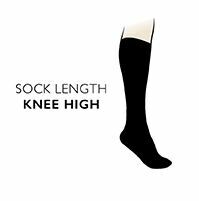 X-Socks Snowboarding Socks are Swiss-designed and Italian manufactured, with left/right specific shaped footbeds to provide customised support that accord to the form of each foot, with support for higher pressure zones that encourage the natural rolling movement of the foot. Made of hollow-core Robur fibres, pads and cushioning at the heels, shins, calves, Achilles tendons, instep and toes reduce friction and absorbs the shock and impact of slope, jump and snowboard activities, preventing bruising and other injury, chafing and blisters, or pressure points forming. The mix of natural, traditional ski socks fibres such as Merino wool and innovative bacteriostatic and anti-allergenic materials like Mythlan ally with air conditioning channels that ventilate and keep feet dry as you ride your board.